Solid as a Rock for more then 30 years! Fenton Poured Walls, Inc. has been servicing the building community in southeastern Michigan for over 30 years. 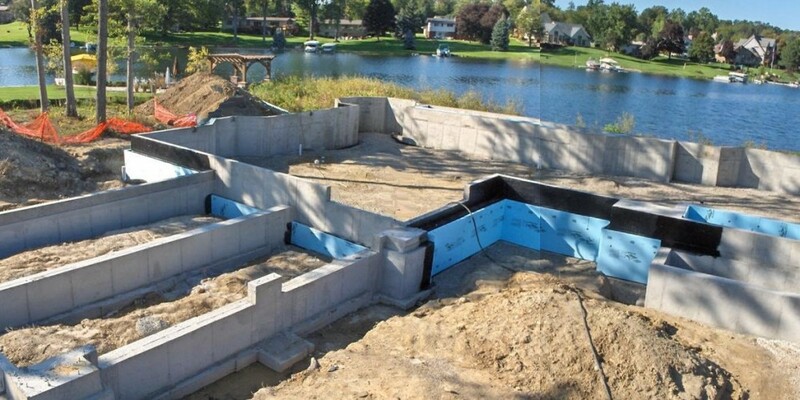 As concrete contractors we specialize in residential and commercial foundations, footings including vertical formed walls for basements, garages, out buildings, piers, grade beams and retaining walls. We have the experience, equipment and resources to handle your foundation project. Our workflow process allows us to help maintain a high degree of accuracy on your project (click here for our work flow process). Our quality aluminum forming systems can provide you with either a smooth faced surface or brickface texture for a quality concrete poured wall (no wood wall forming or rod holes). Here are some of the featured components in foundation construction. * We pour almost any wall height and configuration, from 4′ high walls to 20’+ wall heights. Professional Concrete Placement with our Schwing concrete pump truck (click here for more details). There are a number of waterproofing options you can choose from for a comfortable and dry basement. NOTE: Did you know that a 10-year warranty is better then a Life-Time warranty in the state of Michigan? Michigan’s statute of limitation is seven years. Click here for more information on waterproofing products from Tremco and Rub-R-Wall. Our standard pricing includes dampproofing (the barrier between your exterior basement wall and the soil). After you have decided to work with us, we will redraw your foundation plan for review. For an additional charge, we offer the dimensional accuracy for pinning the footing and wall with the use of a geodimeter robotic layout tool (contact us for more information and details). We offer free estimates. It is important that you carefully review all of your sub contractors pricing so that you have accurate numbers for working with your financial institution (be wary of the low price/deal contractor…there is usually a good reason). Make sure they are properly insured on your job site. [ie. closely review brickledge details and confirm they match framing plan…a common oversight]. We have been specializing in the construction of foundations in the Genesee, Livingston, Shiawassee, Washtenaw, Oakland counties for years and are familiar with many of the townships and municipalities in these areas. Whether you are building a residential home, single or multi-family condominium, townhouse, commercial or industrial foundation, please consider having Fenton Poured Walls work with you on your next project. A foundation contractor serving Michigan for 30 years!